In one of San Francisco's many multi-unit buildings from the early-1900s, Heidi Lender (with the help of John Lum Architecture and Maddern Construction) merged two, top-floor apartments to create a united flat. 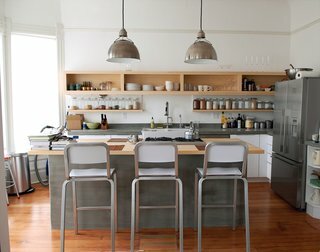 The kitchen—a former bedroom chose for the renovation since it was the room with the best natural light—is "an eclectic take on an Ikea kitchen," says Heidi, who designed the upper Plyboo shelving to complement the concrete countertops and original molding. 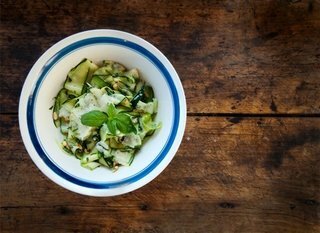 It's here where she whips up her Summer Squash Salad with Parmesan and Pine Nuts, a recipe she received from her "cooking-phobic mom." "If she could swing it, then surely anyone can," Heidi says. "This brilliant, no-brainer recipe has gotten me through many a last-minute summer lunch with friends," Heidi says. "It's a mouth-watering crowd-pleaser—not bad on the eyes either—and the perfect dish for a gardner swimming in squash and basil. The freshest and tastiest zucchinis work best, and I've found that small- to medium-size ones shave much easier than jumbos." Heidi's Summer Squash Salad with Parmesan and Pine Nuts. 1. To make the dressing, whisk olive oil, lemon juice, salt, and black and red peppers together in a bowl. Set aside. 2. Using a vegetable peeler, slice squash from top to bottom into ribbons (about 1/16-inch thick). Place ribbons in a bowl and add basil, pine nuts, and tomatoes (if using). Add dressing and toss. 3. Season with salt and pepper and top with parmesan cheese shavings. Read more about the Lender-Wilhelm Residence in our special 100 Kitchens We Love issue, on newsstands April 5, 2011.